I was travelling this weekend to Firozabad and as I entered the HA-1 coach I realized there was some VIP – people who consider themselves important on account of being able to garner votes from unassuming public - travelling in the attached first AC part or my bogie and hence the second ac half was bound to be illegally occupied by the accompanying security personnel. When I was entering it was about 1 in afternoon and so they were just beginning to start lunch. For someone regular on trains, this was a common sight and I moved ahead to my coupe ignoring the entire scene. As I was settling into my seat - pushing the bag under the berth, putting the bottle in the stragglers, plugging the charger into socket with hope for the blinker to react - I saw a twenty something girl entering into the coach. The coach by now was about full to capacity - well almost. The girl came and hesitantly, occupied the seat in front of me. It wasn't long that an elderly couple came to the same seat that the girl was trying to rest into and demanded their seats. The elderly lady was particularly irate and was ready to pounce on the young girl. The poor girl seemed well educated, was smart and not someone who would occupy someone else seat or travel without a ticket. I reached out to her to check if I could be of help (yeah people I know what's on your mind even though you may know I am happily married). I asked her what her seat number was or if she does not have one probably train conductor could help her out. If she wanted to wait for the conductor, she could occupy the seat next to me. She said she was having a reservation and pointed to the coupe where the security was having their lunch. She said she didn’t want to disturb their lunch and hence requested to let her accommodate here for some time which wasn't the problem. The problem was the fright on her face. It was evident that she would not like to disturb them even after the lunch. All she hoped was that they would vacate her seat on their own. However an hour passed and then two as the train crossed stations after station. And once she realized that they weren't going anywhere I thought of helping out. With the security group there was a senior personnel to whom I requested to let the poor girl have her seat. The person was more than willing and asked his man to shift at once to allow the girl get what was rightfully hers. The issue at hand was resolved but the thinker me (yeah yeah that is just a writing language) started to ponder that as a society probably we are more afraid of our law enforcers than the law which ultimately should govern everyone. Now I do not say that the girls fear was unfounded. I have seen such groups of security personnel creating ruckus. The girl entering into one of the less ordered state of country was bound to be apprehensive about the police from that state. But the issue is do we have to be that afraid. Is the image of police been overtly misrepresented just because it suits our sensational tastes. Every incident possible is reported in media where the police could be demeaned and none of their heroic acts highlighted. Our movies have for long shown police in negative perspective (of course there is one hero in the entire department who takes onto himself to secure justice for world). Now one would say that helping people is the job of our forces and hence that is part of their duty deserving no special credit while their errors need to be brought to light. Perfectly justified argument!! What I wonder is, following this protocol, have we just blabbered about mistakes of few individuals so much that the entire department is now blemished to the extent that even the good men in the force have lost incentive. We may not want to glorify what is just their duty but cases involving police personnel going beyond the call of duty do deserve due credit and acknowledgement. If thought deeply, both the armed forces and police have same ultimate goal – to protect the society from unwanted elements. While scope of activities for the two may differ the end of their means is the same. However, while we treat our armed forces with such high regards – rightly so – we are unable to consider our police forces at the same level. While the forces may have quite a lot of good men ready to die for their country, it is not enough to generate confidence in masses. Police force in particular and society in general needs to focus on what is inherently the cause of this image and how can it be improved. 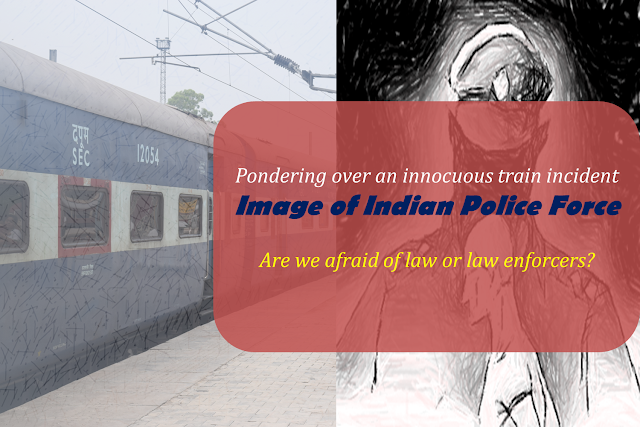 If one goes out to look for examples where the police inaction led to injustices, police themselves committed atrocities or lack of apathy in policemen, the job would really be an easy one and there would be hundreds of such example. Police frequently are blamed to not register FIRs, they are known to botch investigations and at times have been involved themselves in supporting crime of various nature. When this is true and happens with a considerable frequency, an image is bound to be impressed on everyone’s mind. Such impressions gain strength over time and the result is evident in form of the young girl who prefers to give up her seat than requesting men in uniform for her rights. One of the reasons behind this is corruption at various levels which makes the force ineffective and rotten form within. Another ill plaguing the force is the inordinate political interference in its functioning. Today while the officers are chosen based on an Indian Police Services cadre with an aim to promote unity of country; the force has lost its all India nature. Each jurisdiction works in absolute silo and strives to cater to the needs of state political elite. The union government’s role is limited to initial cadre allocation and framing of rules of service. This has created difference between police across states. Another issue faced by the police is their disparity between IPS and IAS. While both the services were created to be parallel and equal contributors to society with specific mandates, IPS have increasingly been subverted to the IAS on ground. Outdated policing methods and reactive nature of protocols have only worsened the state of the force. As with every government department, even police needs a revamp and need is to more towards next generation policing. The concept inherently requires a force armed with combination of cutting-edge technology, modern equipment and behavioral sensitization. Days of public apathy are long gone and the masses of today are ready to revolt to injustices. If the police do not improve, the suppressed anger would someday explode leading to chaos and outcry. Thus it is imperative for the political and administrative leaders to work together to develop strategic and tactical roadmap to bring reforms in the policing culture and system so that we as citizens trust them to secure us in a manner rightful and justified from all societal perspectives. It is only then that – a 20 someone girl would have the courage to ask 5 policemen occupying her seat illegally to move aside.